RcppSMC combines SMCTC template classes for Sequential Monte Carlo and Particle Filters (Johansen, 2009, J Statistical Software, 30:6) with the Rcpp package for R/C++ Integration (Eddelbuettel and Francois, 2011, J Statistical Software, 40:8). RcppSMC allows for easier and more direct access from R to the computational core of the SMC algorithm. Sequential Monte Carlo methods are a very general class of Monte Carlo methods for sampling from sequences of distributions. Simple examples of these algorithms are used very widely in the tracking and signal processing literature. 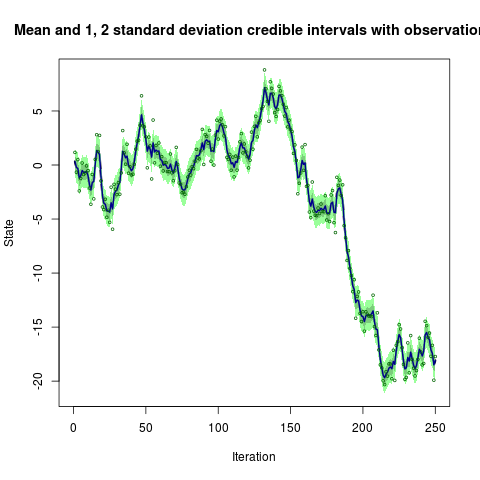 Recent developments illustrate that these techniques have much more general applicability, and can be applied very effectively to statistical inference problems. Unfortunately, these methods are often perceived as being computationally expensive and difficult to implement. By combining the SMCTC with the 'glue' provided by Rcpp, a tighter integration with R is achieved. 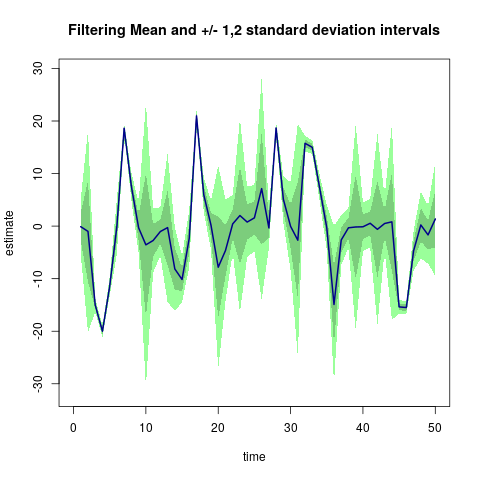 This allows the applied researcher interested in Sequential Monte Carlo and Particle Filter methods to more easily vary input data, summarize outputs, plot results and so on. 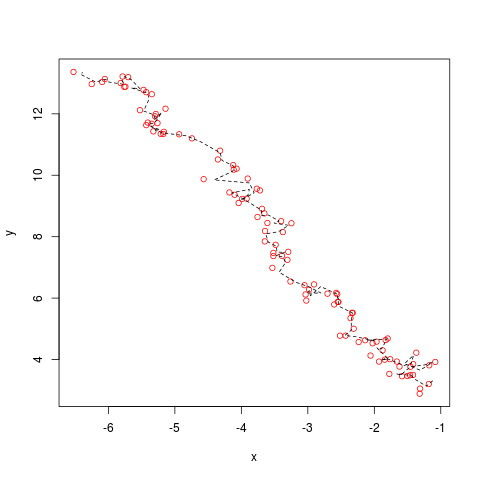 where pfLineartBSOnlinePlot() is a default plotting function provided for this example by the package. blockpfGaussianOpt() provides the Block Sampling Particle Filter of Doucet, Briers and Senecal (2006, JCGS 15:693) in the context of a univariate linear Gaussian model. pfNonlinBS() provides the Bootstrap Particle Filter of Gordon, Salmond and Smith (1993, IEE Proceedings-F 140:107) in the context of the ubiquitous nonlinear model which was used in section 4.1 of that paper. These examples are hopefully of some pedagogic interest and provide templates which can be used to guide the implementation of more complicated algorithms using the Rcpp/SMCTC-combination. We intend to add more example and illustrations over time and aim ultimately to provide a framework to support the straightforward implementation of SMC algorithms which exploits the powerful combination of R and C++. RcppSMC is now a CRAN package. Its source can be found on GitHub within the rcppsmc organization. More information about SMCTC is at this page. RcppSMC is being written by Dirk Eddelbuettel, Adam M. Johansen and Leah F. South. RcppSMC is licensed under the GNU GPL version 2 or later.